4.5 Stars / Top Pick! The Ultimate Rice Cooker Cookbook, by Beth Hensperger, is a great compilation. I have a rice cooker myself- so convenient. 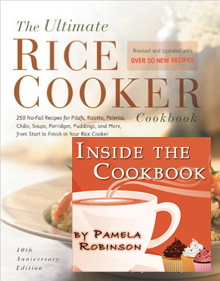 This book includes 250 recipes for every kind of rice dish imaginable. There is a table of contents, which makes the recipes easy to find. I love that this book begins with a Japanese nursery rhyme. I didn't know that rice cookers have been available since the 1950's, interesting fact. I like that the first chapter is step-by-step how to make rice in your rice cooker. The basics are always important. The breakfast and porridge section is really neat- rice cookers aren't for rice only. There is also a section on vegetables that can be cooked, or steamed, in a rice cooker.